Located in the north-central region of the United States - bordering Lake Michigan - Illinois weather is known for its cold winters (especially in the north) and hot summers statewide. Many travelers prefer the more moderate conditions of spring and fall. In summer, the average daily high temperature is near 86º, while winter highs average around 20º. Winter lows below zero are commonplace. Annual rainfall is approximately 34 inches in the north and 46 inches in the south. 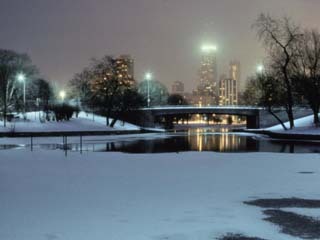 The north receives an average of 30 inches of snow during the winter, while the south receives very little snowfall.